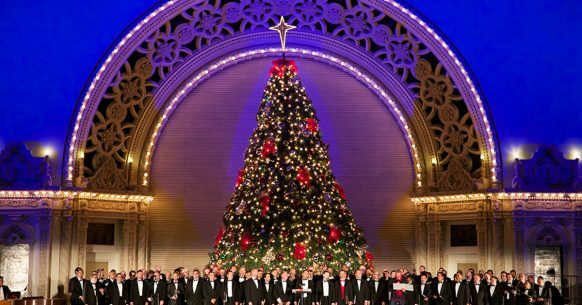 It’s the holiday season and Balboa Park is the place to make merry. But it’s not just how festive Balboa Park looks and more about the very many ways to enjoy the season with a full slate of special events. From the popular December Nights to avant-garde exhibits, Balboa Park is a place to sparkle, shine and explore. The Timken Museum is known annual holiday tree displaying the opulent ornaments in its Hord & Schlappi collection, also known as the Jewels of the Season. These elaborate and eye-catching ornaments are the work of local artist Florence Hord. Over the course of 80 years, she along with family friend Elizabeth Schlappi made more than 2,000 ornaments. Now, devotees to these Jewels of the Season will have a chance to make their own glittering versions. Using a curated selection of jewels, colors and filigree, Elizabeth will guide participants through a step-by-step process on making these holiday keepsakes. The class costs $45 for members and $55 for non-members and all materials are included. The workshop runs from 10:00 AM to noon. Looking for the full Monty of holiday celebrations? Then gear up and get over to Balboa Park for the 41st annual December Nights. The popular event features food, folks and fun with a variety of holiday-inspired performances and other surprises. It’s free to roam through park and the museums are also free and open to public between 5:00 and 9:00 PM. Want to put in a good word with red-suited big guy? Nine different Santa “representatives” will lend a knee, including a Harley-riding one at San Diego Automotive Museum. Looking for a more adult type of holiday spirit? The Fleet Science Center’s Black Hole, a 21 and up lounge, will have craft beer, wine and cocktails along with food, board games and other fun. Are you tired of the consumerism and cynicism of the holiday season? The Old Globe’s “Clint Black’s Looking for Christmas” musical might just be the perfect antidote for your antipathy. Inspired by country crooner Black’s chart-topping 1995 holiday album, the show follows Staff Sergeant Mike Randolf as he returns home from Afghanistan, trying to recover from the trauma of combat while searching for the true meaning of the season with the help of his wife and nine-year-old daughter. The San Diego Union-Tribune says the musical, which is making its world premiere at the Old Globe, offers an “affecting story of family and personal turmoil with straightforward, unabashed sincerity and a string of tuneful songs.” Of course, if you want something a little greener and grumpier, the Old Globe classic “Dr. Seuss’s How the Grinch Stole Christmas” is also playing through Dec. 29. A rising tide lifts all thoughts is at the heart of this multi-media show featuring exhibits by three local artists who have created “immersive environments that evoke stillness and space for contemplation”. Each artist takes on its subject matter through different mediums. With his Parallel Planes, Francisco Eme explores language and identity through interactive installations that include audio recordings of border crossings, works on paper and an interactive video. Latvian-born artist Jana Brike’s Sea of Change features eight large-scale oil paintings designed specifically for the space and feature women in various whimsical worlds. Jacob Sundstrom, a Ph.D. student in computer music at UC San Diego, will offer up Erasure, a visual and sound installation that features 3-D imaging of coral reefs showing these reefs breakdown and bounce back based on human interaction. Sundstrom’s exhibit is part of a newly announced alliance with UC San Diego’s Qualcomm Institute that aims to fuse cutting-edge technology and contemporary art in the heart of Balboa Park. Training your sights on some holiday fun, the San Diego Model Railroad Museum has you covered no matter your age. If you love craft beer, ugly holiday sweater contest, then climb abroad for the museum’s Ales ‘n’ Rails. The $25 ticket includes tastings from some of San Diego’s more notable craft breweries including Mike Hess Brewing and Pizza Port Brewing Co. all while supporting the museum’s model railroad mission. For the younger set, the museum will screen the Polar Express on December 15. Attendees are encouraged to come in pajamas and curl up with their favorite blanket while they watch this Christmas classic. As an added bonus, kids will receive a special keepsake and a visit from Santa. The event goes from 11:00 AM to 3:00 PM. Enjoy the ultimate holiday tradition with the San Diego Civic Youth Ballet’s performance of The Nutcracker. Set to the timeless music of the Tchaikovsky, the ballet offers an extraordinary journey to the magical Land of Sweets with Clara and her Nutcracker Prince. There are battles, the enchanted land of falling snow, waltzing flowers and the dance of the Sugar Plum Fairy. Tickets range from $12 to $18 and shows are either at 2:00 PM or 7:00 PM. Celebrate the 50th Anniversary of the Apollo 8 with one of the actual astronauts who served on the mission. Bill Anders will be on hand to commemorate the historic December 1968 mission that featured the first manned flight to travel around the moon. As part of the three-astronaut crew, Anders was one of the first people to see the Earth as a whole planet as well as witness the far side of the Moon. The evening will also celebrate the naming of the “Anders’ Earthrise” crater on the Moon. It will also feature a cocktail hour and a sit-down dinner. Tickets are $195, and the festivities begin at 5:30 PM. This entry was posted in Top Things to Do and tagged balboa park, entertainment by Jennifer Davies. Bookmark the permalink.